OK, we’ve had enough, we have to uncover the truth behind the BinaryOptionsWatchDog.com web site. It is a bunch of scammers led by Michael Freeman. Freeman is popular in the binary options community because of his video channel on YouTube, but he has gone too far, he is endorsing scams, and he even may be orchestrating some of these scams. The Binary Options Watch Dog web site is supposed to uncover binary options scams, which it does in some cases, but when you can make money supporting a scam, they just do it. In other words, if a scam has an affiliate program and Freeman can earn commissions, he writes a fake review and gives his recommendation to this scam. How do we know that? 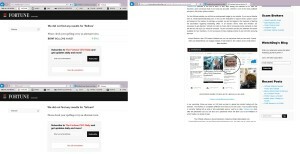 You just have to look at the links they provide, when they link to a scam, the use an affiliate link via the Clicksure network, for example 82940.virtnext.cpa.clicksure.com. So if somebody joins the scam through their link, they will get paid. This why they endorse scams, they make money on them. 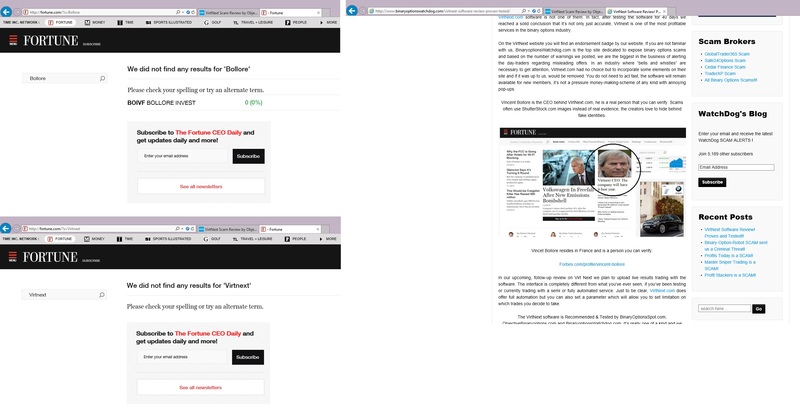 Proof that Binary Options Watch Dog faked the screenshot of Fortune Magazine. 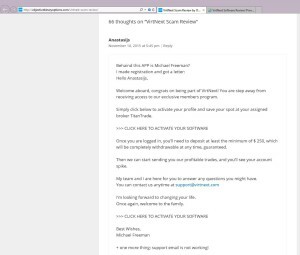 The most obvious example is the newest scam called Virtnext. Not only Binary Options Watch Dog is recommending this obvious scam, but they also faked proofs to make it look legit. 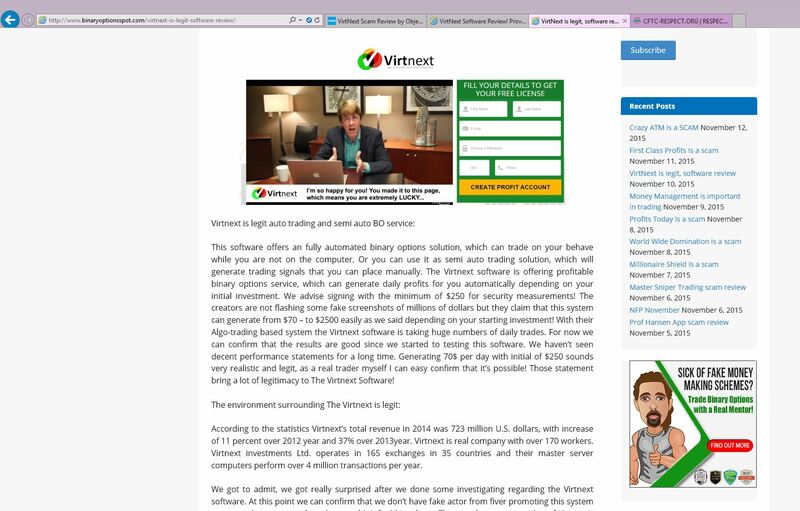 Because they say that there is a real person behind Virtnext – the billionaire Vincent Bollore – and they show a screenshot of the Fortune web site with an article about Virtnext and Bollore. But it is a fake, Fortune has never published anything about Bollore or Virtnext, see images or try yourself to do a search on the Fortune’s web site (here and here). 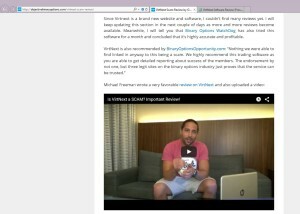 Michael Freeman signed under the Virtnext welcome e-mail. This is a 100 % proof that BinaryOptionsWatchDog.com is actively supporting binary options scams. And there is more, because somebody posted his welcome e-mail from Virtnext, and it was signed by Michael Freeman himself! So he probably is the person directly behind this scam. We can see that there are a lot of fake binary options reviews web sites that were built only to support scams and make them look legit. Some of them are probably in a network with Binary Options Watch Dog, like Objective Binary Options a Binary Options Spot, because they all are supporting Virtnext with their logos and fake reviews. It is incredibly sad what is happening in the binary options industry right now. For 1 honest web site there are 99 scammer’s web sites that are recommending scams. The safest is really not to trust any binary options automated trading system or strategy that is offered in a way that you have to open an account with a broker, deposit money and immediately trade the system. Do not trust anyone who wants you to this. Trade only with regulated brokers, the best is to trade your own strategy manually. When somebody claims that a system or strategy is free, do not trust them, unless they let you try it for free without depositing money. And do not rely on reviews published on the Internet by scammers like Binary Options Watch Dog, Objective Binary Options or Binary Options Spot. The vast majority of review sites are unfortunately fake and dishonest. 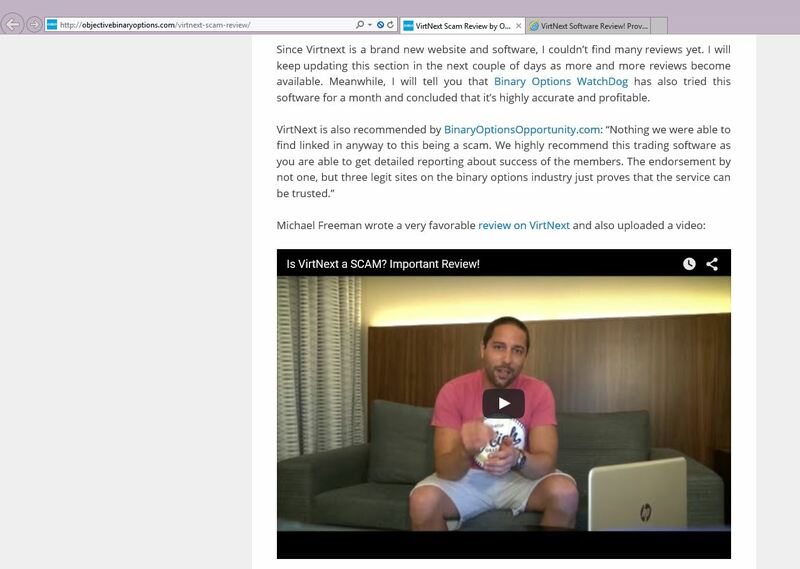 “Binary Options Spot” and “Objective Binary Options” web sites supporting Virtnext and Michael Freeman. Thanks for exposing that scummy marketer. I agree with you. These scammer sites will never publish the comments that are against that SCAM App. can you suggest any signal service which is legit? Do you recommend quadra signals or any other manual signal services. If yes plz email me. Is this why Binary Options Watch Dog is off the web today? Very true, that Louis guy from Trusted Binary Reviews is probably the worst. A total scammer who tries to pretend that he is helping people avoid scams. He promotes so many scams on his Youtube channel. Also. It looks like watchdog are promoting what looks to be, a ponzi scheme on there website, called Forex Paradise. They say the company has been around for 5 years but on the website it says 600+ days? And they only accept the typical ponzi scheme payments, no cc’s. Cedrick………you are SO right !………….best advice is as suggested earlier = stay away from Binary Options……..PERIOD ! Hi, unfortunately I haven’t seen any profitable binary option robot or signal service. In my opinion the only reliable way is to learn trading and trade with regulated brokers only. All binary auto trader software sites are scams so beware! Binary trading is risky but a legitimate and legal form of trading. You can make money if you have done your homework and learnt to trade properly with proper money management and a trading plan that is tried and tested for at least 6 months. Use a regulated broker and trade a demo account first. Sure, use signals (NOT autotraders), why not, but at some point you should be getting to the point where your own strategy starts to beat the signals, that’s the point you will become a real trader. Vincent Bollore is a real person with no affiliation to Virtnext and I bet he will be calling his lawyers soon, Michael…….. Thank you for posting this. I started noticing similarities in a lot of the write-ups and got suspicious. I tried Virtnext – luckily, I deposited with VisaDebit – my bank clawed my money back. Virtnext lost my $200 + dollars, even after I shut it off; that’s when I called the bank. Thanks again for being a stand-up guy. I have fallen victim to The binary options watchdog i believed what they said about centument and this is a piece of chit software. 250 euros gone in less than 12 hours. I turned off auto trader after 5 quick trades but it kept on taking trades until my money had gone.Also when i leave comments on The binary options watchdog,yup you guessed it they delete..Beware people!!! Keith Wareing (Option Xpert) and Louis (Trusted Binary Reviews) on Youtube are also as bad. Giving good review for these crappy scams and their subscribers get sucked in an lose all their money. Yes, you are right, thank you. Details in our Tauribot review. Binary Options Watchdog certainly appears to be a scam based on the experiences I have had, following the recommendations they make on their website. On becoming suspicious that all was not well with Trading Sites that they had stated were NOT SCAMS I endeavoured to contact the Watchdog but have received absolutely no feedback for any issues I brought up. I noticed later that many of the Binary Option Companies they indicated as not being scams were actually being reported as being scams on other website reviews. My advice is to have nothing to do with BinaryOptionsWatchdog! Despite all proclamations of online transparency, things are evidenty not free of murk. It is surprising that no agencies have embarked on regulating the industry, including the review sites. Any takers ? FTC, for instance ? After doing lots of research and seeing conflicting information on WatchDog, I was beginning to suspect that they too were scamming people. They do a really good job unless you actually read read read. In the binary options blacklist, they list DowJonesGroup, and yet in another area they recommend them. I also read that you should stay away from offshore companies yet they recommend tauribot. When signing up for tauribot I was directed to GlenRidge to make a deposit. Fortunately, I was unable to make a deposit at that time. A few days later I received a call from a number that stated it was from New York, but when Richard Hawley, the caller, sent me his info in an e-mail it was all contact info for Thailand. He told me if I deposited $500 instead of the minimum $250, they would match it so I’d have $500 to trade with. I then read on the CFTC.gov site that this is exactly what the scammers do. Basically, a lot of scammers, including “anti-scam” sites, are easy to spot. You google the name with scam or fraud and you’ll soon get an article: Blabla fraud exposed, in which the product is actually recommended and te scammer provides links. I personally don’t think that it is a scam website as there are many reviews of them which are turned to be true. They are absolutely scam, whenever i post a true negative comment they delete it. Just look at the facts… You can’t find ONE single bad comment on that site… Not one… A trusted review website would never have to “accept” comments from users if they are legit in what they are doing..
Congrats! that is a really HONEST review!!! .. I think they are a very BIG MAFIA and they have many more website , Binary Options Watch Dog IS ONLY ONE OF THEM.. I was checking alot of binary options scammers websites and I found binaryoptionsanonymous.com, and they “recommended” this blogs (all of them the same S..hit as Binary Options Watch Dog , please check all this websites are almost all the same big bull Sh..it! and all of them recommended all the FAKE softwares including the BIGER SCAMMER Virtnext!.. Yeah, scammers have huge networks, so it is diffucult to outrank them in search engines with only one web site like ours, because they are linking their web sites in these networks. What does it take to site a BO site. I have been using copybuffetsoftware for a few days.. on autotrader all the time have only earned $14. Also the signals are different on my ipad from those on my laptop. also the same asset might be call on one and put on another at the same time. How can this be if tthe signals are true? Hi, you cannot have opposite signals on the same asset at the same time, because it means a sure loss on binary options. This proves that Copy Buffett is worth nothing. Run away from binary option, fly away! They are all scams. All what you call regulated is all trash. No body is regulating any body, Rather they earn commissions from this scamists referred to as brokers. IF you give them money huh, they will manipulate the price, deny your withdrawal, blacklist you, block you, even try to steal money from your card. All kinds of ills you get with this people you cant see face to face with no background or trace. The one they call GOPTION, thry call me every minutes to come and pay or deposit. Fake all fake. Hi, regulated brokers are regulated, for example Nadex in the US by the CFTC, EU brokers mostly by the CySEC. The brokers we recommend are good and we have no complaints about them. Goption is not regulated and there are far more problems with unregulated brokers. Good post about this scam website. I have to intervene against CySec, which is not a serious regulator. You want to avoid broker that are ONLY regulated by CySec and look for CySec + other EU regulators! I am interested in trading Binary options and have been doing research and home work on the subject and reading many posts, forums etc and I have to agree with yourself, There appears to be No legitimate Binary Trading platforms/ Auto bots and brokers, other than the registered and regulated one’s. Hi, binary options trading is very similar to Forex, the main difference is that exits are predetermined. So you can look for Forex learning materials, I think a good web site with a forum is Babypips.com. Love this post. I’m so delighted to see the alerted state of mind of binary option scam services. It will help twho tyr to trade to choose the correct one(s). Thank you! After read all comments, i realize that its truth that the Watchdog is a scam. Because whenever i post some comments they never reply or never shown at the comments area. is it deleted? If Watchdog is a scam that means the reviewer (Marili) also a scam? Besides that is the copy buffet a scam? how about BINARYBOOK ? and binadroid? and the Banc De Binary? Hi, reviewers at Binaryoptionswatchdog obviously are scammers, because they publish fake reviews. Binarybook is a bad and unregulated broker. Binadroid is a scam and Banc de Binary is a regulated broker, but we hear lots of complaints about them. Hey, don’t you know that Marili is the daughter of the owner of Binary Option Sheriff? And for all of you, even a formerly non scam autotrader will turn into scam after several months. So you must understand the art of trading with autotraders. Keep an eye, get some reviews. If you know that the autotrader has been running for 3 months after the launching and you haven’t joined it, you’d better let it go for you are too late to be part of it. Let’s say you have one or two month to collect all the informations you need. More than that, you’d better stay away otherwise you can get scammed. Tried Binatrade from watch dog suggestion, lost 300$ real quick. Is it possible I actually found an honest reviewer? Awesome!!! I thought I was only one lost money with Binadroid garbage and SafeIncome garbage!!! Everybody on reviews loves them….I just lose money! It’s Nadex for me! I can actually make a bit there, trading myself. I’ve tried 10-15 auto traders….NOT ONE has made me anything! Virtnext and copy Buffet … I have lost a lot of money to them thanks to trusting Binary Options Watchdog I even used Marili who was supposed to help me with Copy Buffet regular emails back and forward offering help and advice, but the software only traded one pair EUR/USD and lost a lot of my money until I finally switched on about 2 weeks ago that Binary Options Watchdog and Marili are both scammers, she just helped me lose my money faster, I would enjoy seeing them all brought down, I believe they should be regulated when offering honest/dishonest advice, I hate scummy people like this it makes me sick that they should take money normally from those who need it the most, as the richer people buy trusted signals and make money. if anyone knows how to bring these people to justice I offer my services with whatever help I can give. I forgot to mention in my last grizzle that I also tried Mikes Auto System. I got 13 losing signals 6 wins. I can do better than that with my eyes shut. I am also worried that I trusted 2 traders recommended by Mike 24 Option and Swissroyalbanc. They still have what is left of my money. What will happen now? Hi, try to withdraw what remains. 24 Option is regulated, so it should be possible, with Swiss Royal Banc it might be more difficult, by try it. I also think that binary options watchdog may be a scam. They heavily promoted Binadroid which i think is a clever scam. Binadroid has no contact and support section. After registration, any attempt to login will receive messages like; ‘we could not verify your login details. Please try again. Before the deposit one could login several times a day. It’s better to register with a top broker , get education and an account manager to help you trade even if with a fifty-fifty percentage than relying on these robots. I share your sentiments about watchdog. I thought that WatchDog it was a legitimate site and through them I joined the CopyBullet service, located at the top of their ranking of reviews. After registering, CopyBuffett assigned me a broker not regulated… at this point I did other inscriptions and recived two other brokers… of course, these are not regulated. I posted a negative comment on their website and of course not published it! I like to see if indeed this post will be posted or not, I reside in Australia came across Binaryoptionswatchdog website when was looking for a review for TitanTrade. Watchdog had a long blog post all about TitanTrade then hundreds of comments from people who lost money and some of these comments were from Facebook. Happens that WatchDog is indeed a scam website why would be telling people to stay away from TitanTrade? Then read a blog about CopyBuffett and a lot of comments were in positive manner. Question is that WatchDog is a scam side would that mean TitanTrade is the real deal and CooyBuffett is not? That being said I have not had any of my posts allowed and one was for TitanTrade feeling bad from all those people who lost thousands of dollars and stopping a good friend of mine signing documents and the other is a positive review about many people making money with CopyBuffett. I also sent an Email to WatchDog currently no reply back. Well, difficult to say how they chose scams they will promote for money and scams they will uncover, but the reality is that some of their reviews are real and some of them are fake. They probably want to look legit, so they don’t endorse every scam out there, just some of them. Hi Grant, as long as it’s not spamming we appreaciate when people share links to our web site. Because scammers have big networks with interlinked web sites, so it is hard to spread to word about the true nature of theses binary options robots. They also have a network of Youtube channels where they published fake reviews. Hi Grant, I’d say that the CFTC-Respect web site is the definition of hypocrisy. It seems to be a complete list of web sites that form a private network of scammers that publish fake reviews and endorse scams with affiliate links. On one side they say they respect CFTC rules, on the other side they push US citizens to unregulated brokers through huge scams like Copy Buffett or NEO2, they use fake reviews for that. We don’t need to take the pledge, because we have always respected CFTC rules and the only broker we recommend to US traders is Nadex, which is regulated in the US. I’d expect that CFTC-Respect web site would not accept us anyway, because we are not part of their scam network an we uncover their practices. Hi John I thought you maybe interested in what I have found and people who have read your blog and commented also need to see this. I feel this is not right take a look at this website and you know what I mean cftc-respect.org/code-of-conduct/ seems that WatchDog has taken the pledge. Could be a good idea to also take the pledge unless it’s like a scam site endorsing scams. I have tried Mike´s Autotrader and Autobinarysignals for trading binary options. None of them worked as they should do and I lost the money. I have found a video clip on Youtube which is talking about Michael Freeman and those you can see on the video. The link to the video is https://www.youtube.com/watch?v=eMWGqM-ENX4. Could someone write a comment about his video? Hello, thank you for your review. I think that you two are the only who says this about Watch Dog. I tried Binabot, but I had problems with registration. I have send e-mail to Watch Dog if they have any contact on them (because Binabot do not have any support mail on their website). It has been 14 days since I wrote them, but nothing has happened. So I started being suspicious about them and found you and Anna from the blog mentioned above. Hi. Glad I stumbled across your site. I have been thinking for a long time that binaryoptionswatchdog is a scam review site. They have never posted any of my complaints nor answered any of my questions about software like Copy Buffett. I have not been able to contact support@copybuffet regarding the quality of the signals I receive. The signals are extremely poor and the auto trader is worse. It caused my starting balance of $500 to go down by $250, very, very quickly. I finally turned off the auto trader for fear of losing my entire balance. I noticed that about 50% of the time, if the broker allowed 10 minute trades, I could sometimes win using the Copy Buffet signals, but of course, UKOptions does not allow 10 minute trades! I even sent 3 screenshots to binaryoptionswatchdog, but got absolutely nothing from them in return – so suggestions as to how to reach Copy Buffett support personnell, nothing! Of course they never posted anything I wrote. I will not receive any more e-mails from the so called, “watchdog”. As far as I am concerned, the watchdog is much worse than the scam software “developers” he takes money from. He must be smiling all the way to the bank! i strongly agreed copy buffet is scam side which is claim positive review by watchdog, l lost from my deposit USD250 into USD78, then finally withdraw my balance. It obviously which all people said is good trust option like watchdog are affiliate to scammer option side. Now i not trust watchdog anymore. Mostly of binary option industries is 90% control by scam website. My suggestion is you need to learn how to trade manually with regulated broker with your own experience and refer to who is more expect in binary option as professional trader to generate good profit in future. Giambrone’s Binary Options Trading Litigation team has received several complaints by international investors about Banc de Binary, a binary options broker founded by Oren Shabat Laurent, a American and Israeli citizen who lives in Tel Aviv and permanently barred from doing any business in the United States or with US person. Giambrone’s Forex and Binary Options Litigation Team is currently investigating complaints of fraudulent binary options trading by investors against Banc de Binary, a Cypriot and Israeli investment firm trading in binary options along with ET Binary Options Ltd, BO Systems, Ltd and BDB Services, Ltd (which are based in Israel and the Republic of Seychelles). Giambrone is calling investors and traders who have lost funds with Banc De Binary to contact us for an immediate review of your case. In view of the large number of complaints received, our lawyers have already reported these complaints to the CFTC, the European Securities and Markets Authority, the Cyprus Securities and Exchange Commission, the Israel Securities Authority, the Ontario Securities Commission, the Swiss Financial Market Supervisory Authority, the Italian CONSOB, the Australian watchdog ASIC, the New Zealand watchdog FMA and the U.K. Financial Conduct Authority pursuant to the recent “Memorandum of Understanding on the cooperation and exchange of Information” between the USA and Europe. I was also scammed by banc de binary in 2013. I deposited an amount of 250 USD with my credit card. As soon as this was done, they withdrew another 250 USD from my credit card without authorization. After that my account went down without me placing any trades. I contacted them but the same voice operator always answered , a recording with no response to my queries. I lost all my money, I also used Mikes binary signals but a load of BS. Most of the trades were losses thereby confirming that he is a scam artist. I am from South Africa. I thought I knew these binary option robots were rubbish but still nearly fell for the slick advertising and presentations. Luckily I found your honest review on to BinaryOption Watch Dog. Thank you for saving my money and my time! I have read most of the comments on this page and it is sad to realise how many dishonest people there are out there. I will make this as short as possible. I deposited £8500 in total with Secured Options and they gave me an account manager that was telling me what to trade. I had some wins and a few losses but then I got a few big wins which brought my account up to £23,851. Wow, it was almost what I needed to go back to my home country and be with my children and grandchildren again. I was ecstatic. THEN – my account manager advised me to make a trade and put all the money on. (this is all on skype and I still have the conversations in writing) I only traded 10,000 and told him that I could not afford to lose any money and was not trading it all. He immediately asked me what I thought I was doing as he had already committed the money to our professional advisors trading room and I was costing the company money and must trade it immediately. SO, I did as I was told and guess what? YES, I lost every penny. I cried for a week as the initial deposit was almost a years savings. So that means I have to work in England for another year or two at least before I can go back home permanently. I don’t suppose there is any way of getting my initial deposit back? Can anyone give me any advice please? I am really desperate. Have you heard of Binary options Trading Signals by this guy called Franco? Has anyone tried it before? Is it also a scam? Appreciate your feedback. I never heard about it before. I had a look at it and I see that they have an affiliate program, so you will find a lot of fake reviews endorsing Franco’s signals for money. Thanks for your speedy reply. Apparently the Franco binary options signals are live streamed with audio through Skype from 9:30 to 11:30AM EST, Monday to Friday. It claimed that his signals have an overall ITM of at least 85%. “At least” 85% win rate is impossible in the long run. Great and honest comments! I think there are still few legit option robots in the market like optionrobot.com which allows demo trading, free broker selection, and free settings. Then, what can you say about Zulu trade, tradeo, etoro, and any option/copyop. It is evident that majority of these review blogs have failed us. Optionrobot.com is a scam – see the review. The demo is fake and you have no free choice of brokers, there is a limited list. Copyop is a scam – see the review. Concerning other social trading platforms, I haver never seen anybody making consistent profits in social trading. This industry is full of fake reviews. Has anyone tried autotrader from signals365.net? 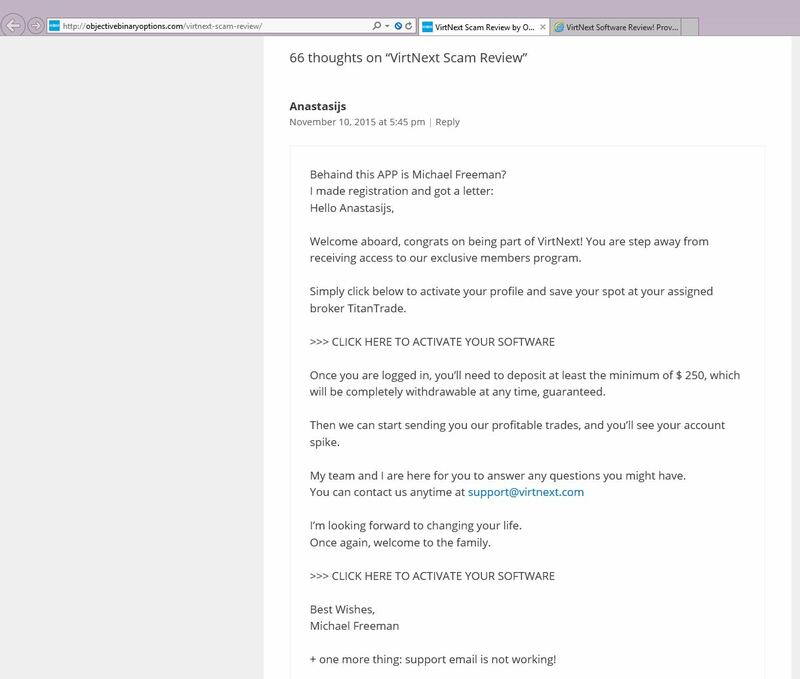 Hi, it’s a scam, see the Signals365 review. The clone of this scam is called Investoo. I’m talking about autotrader, I think that is new, not signals, the review is for signals. In demo mode winning ratio is about 75%. These scams often use demos that fake results. So try to take the same trades on a genuine demo account with a regulated broker and compare them to Signals365. Then you will see the truth. Did you hear of Tmoption. They are private binary option company. I’ve lost a lot of money with binary online and unable to withdraw money due to accepted bonus. TM option suggested to register with them, activate the account and they would redirect the funds from the broker to the account with them. After the redirection there would be a charge. Also they said I could withdraw money without problem. What is your take on that? So be very careful. Recovery rooms use a lot of dirty tricks. They might let you see a fake balance on their website, you will pay a fee, but then you will not be able to withdraw anything. If their address is Tmoption.com, then I am almost sure that it is a scam. Because it is an anonymous broker with no licence and the domain is owned by a guy from Nigeria. They provide no real contact address. I would never pay anything until I see the recovered money in my bank account. If they say “we have your money, pay us a fee”, then it’s a scam. Because they could take the fee from the money they recover. Then there is also the risk with providing your personal information to these anonymous recovery rooms. It would have to be a registered and licensed company for me to maybe trust them. Thanks for your quick answer. Yes, it is TMoption.com. I had the suspicion that it is a scam. The first time I tried contacting them the phone numbers were out of service and the email came back with delivery failure. Now they contacted me out of the blue. I have an idea where they got the number from. They say I have to fund the account to be an active member before they start the redirection process. And that would take about 48 hours. They want your money first, so it’s clear, it’s a recovery scam. lol everything is a scam for u guys get a life!! I have a great life, partly because I help people not to lose money with binary options scams. It’s sad to see comments on our website from people who wish they read our reviews before investing with those scams and great to see comments from people thanking us for saving their money. Olymp Trade is not regulated, stay away! Hello what is your opinion about closeoption.com? Hi, this broker is not regulated, stay away. If you mean prestigebinaryoptions.com, it’s a typical fake review / scam website. They expose some scams to gain credibility, but then they endorse other scams for money. Hi There can anyone send some info on Edgedale Finance. I know they are scammers but I need some proof they were trading Binary Options. Thanks Andy.